Was Marks and Spencer really as tragic as I seem to remember? There was a time, I'm sure, when Marks and Spencer was daddish and button-down, a vendor of bad shirts and blue jeans, the one place in any given big-ish city where you were guaranteed to find a Panama hat if you needed one at short notice and had maybe 25 quid on you. Maybe getting past the dreaded age of 30 makes one look at M&S with a little more relaxed detachment. Or maybe Marks and Sparks really was dull and uninspired back when your correspondent was younger, rounder, and wore band t-shirts far too much. Whatever the Cool Status of Marksies is (and I'm sure the boys in the lab are working hard to get a clear answer on this) it's undeniable that over the past couple of years their selection of own-brand beers has made waves and set high bars. 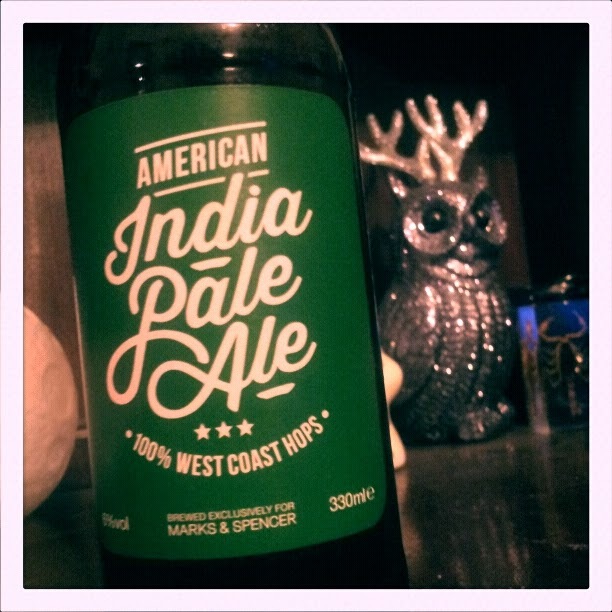 And with that, it's time to open Arbor Ales' American India Pale Ale, one of the more recent additions to the M&S stable. From the neck this IPA oozes the shadowed scents of a midnight grapefruit farm, the pregnant and swollen fruits tinged with just a little raw, life-giving dirt. A quick pour, as the beer slips eagerly from the bottle, elicits a tree-sap gold; sparklingly clear and danced in by helices of carbonation when one moves the glass to get a better look at the beer within. With the first mouthful the beer undoes the fruit plantation images that it conjured in this correspondent's skull. The first mouthful, and the majority of those subsequent to it, is that of pine. Powerful, sappy, woody notes claustrophobically envelop the taste sensors. The aftertaste is a cloying back-snap, trapping the tastebuds and refusing to let go, like primordial tree resin ensnaring insects in some long forgotten Holocene forest. It's just trees as far as the eye can see. It's a sojourn in Skyrim's greenest nightscapes, a silent float through Sasquatch-infested arbors of a primaeval America. It's The Girl Who Loved Tom Gordon's weirder scenes of forest insanity squeezed into a bottle and poured into a glass. There's still some fruit in the mix, a grapefruit cart stomped over by the gathered treemen of an Entmoot. The forest overpowers all of it, and the 6% abv makes for a pleasant wood-fired burn as the trees begin to blot out the moon. The beer breathes its last into the forest with the drawn out, rich and juicy final taste. This resinous forest-in-a-bottle from Bristol's Arbor Ales leaves a lingering scent of green leafed vertigo in the glass, knowing that you'll come back to the woods.